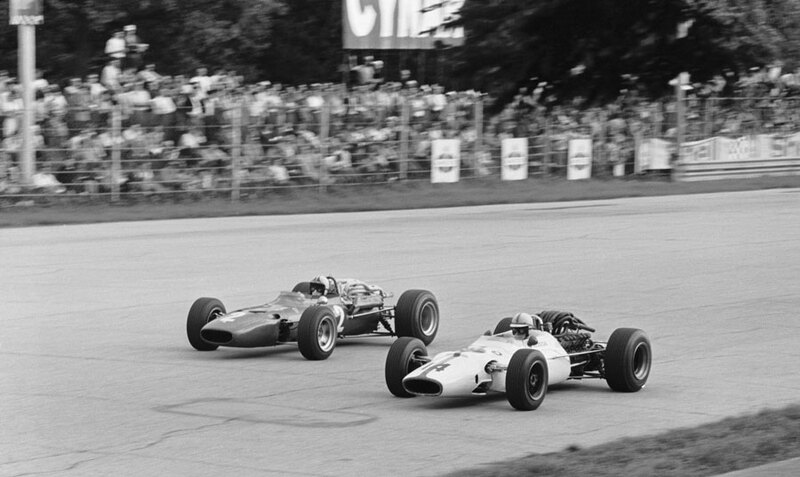 John Surtees won an epic Italian Grand Prix at Monza, beating Jack Brabham in one of the closest finishes seen for years. The result meant Brabham was only three points behind team-mate Denny Hulme in the drivers' championship with two rounds remaining. Remarkably, given the passion of the fans at Monza, for the fifth grand prix in succession Enzo Ferrari only entered one car - that of Chris Amon - arguing that following the death of Lorenzo Bandini there were no more Italian drivers good enough. Michael Parkes' season-ending accident at Spa had caused Ludovico Scarfiotti to reconsider his position, and that left Ferrari unimpressed. He dumped Scarfiotti, arguing he would not prepare a car for someone who could not win. To Ferrari's disgust, Scarfiotti was offered and accepted a drive for the Anglo-American Eagle team. To add to Ferrari's anger, Lotus stole a public relations advantage by entering a third car driven by Giancarlo Baghetti, the Milan-born former Ferrari driver, in what was to be his last grand prix. The grid was unusual as some of the faster cars had still to post their quickest laps when a massive storm hit Monza and washed out the final practice session. The start was chaotic as there was confusion between drivers and the starter, with the result the leading cars raced away too early, and the starter could do little but feebly wave the start flag as the field sped past. There was early drama for Jim Clark because after 13 laps he had to pit to change a punctured tyre and he lost a complete lap. Out front the two Brabhams were swapping the lead but Clark, still a lap behind, was also in the same slip-steaming group. By the 20th lap there had been five different leaders. All eyes were on Clark as he started to pull ahead of the rest, in a bid to make up the lost lap, and with two laps to go he passed both Surtees and Brabham, who were contesting first place. Clark had done the impossible and made up a complete lap. Seven laps from the end Clark took the lead, but three miles from the finish his Lotus began to splutter and halfway through the last lap he was passed by Surtees and Brabham almost side by side. Surtees led into the final straight, but Brabham pulled out from his slipsteam and came within a whisker of overtaking him before the finish. Clark was left to freewheel over the line to take third. A huge crowd descended on Monza to see the new Ferrari, which was smaller, lighter, slimmer and aerodynamically enhanced, and which had only started testing four days earlier. Amon was one of only seven finishers but was several laps off the pace after suffering suspension issues.